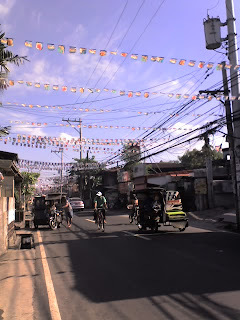 It’s barrio fiesta here in our barangay and I remember many special moments with my high school friends during fiestas. Of course Bes JennyL would always be there in our house during those occasions. During those days I’ve always looked forward to fiestas because it’s nice to watch amateur, parade and of course the food! My mom is a great cook and she always took time to cook the special and time-consuming menu like hamonado and lumpia which took a lot of preparation to do unlike the usual other menus of my mom like menudo, kaldereta, mechado. Barrio fiesta is only celebrated by the so-called ‘taga-barrio’ which is dominantly populated by the Bombay-looking people in Cainta including my ancestors – the one that they called sepoys or Indian soldiers. Because it’s a barrio fiesta the common visitors are also from the same or nearby town unlike town fiesta which usually invites people from faraway places. Actually me and my friends sometimes hopped in each other houses just to taste desserts like if our house have fruit salad we will eat some other kind of dessert on our other friend’s house, just for fun really! Anyway we were very young then and occasions make us happy. Now I’ve grown up and became a born-again Christian we never celebrate and attend fiesta anymore. Beliefs and traditions change as you grow older and mature in the spiritual side of life. Those fun memories are part of my happy teenage years and will always be special.